Coach John Kreese lays out a few quick offensive plays. 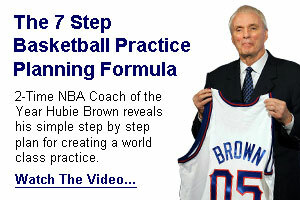 Great video for understanding how to execute a Triangle offense as well as the benefits and negatives for the play! This is a great video to use for a reference when teaching your young players some different options with the half court offense. One of the deadliest moves in the game is broken down by Allen Iverson and D-Wade as they describe how they developed their own move and who they adopted it from, as well as the evolution of the move to present day. Offensive basketball is primarily played with the ball in a teammates' hands. Four-Fifths of the time, you don't have the ball. What you do with this time has a direct relationship to your and the team's success. It all starts with your fundamental position. Check out a great video & read Coach Ken's fine details! Learn how your youth players can be active and create open shots with a simple Motion offense. If you have only 1 play in your playbook, this is the play for a youth basketball team. With this simple philosophy, your team will never be caught standing around on offense.